I used to think homemade granola was boring and pointless. That no one would eat it and it was a waste of ingredients. But every time I make it, my family proves me wrong – they LOVE it. In the spring I make strawberry and chocolate granola clusters, and in the fall I make cranberry orange granola. 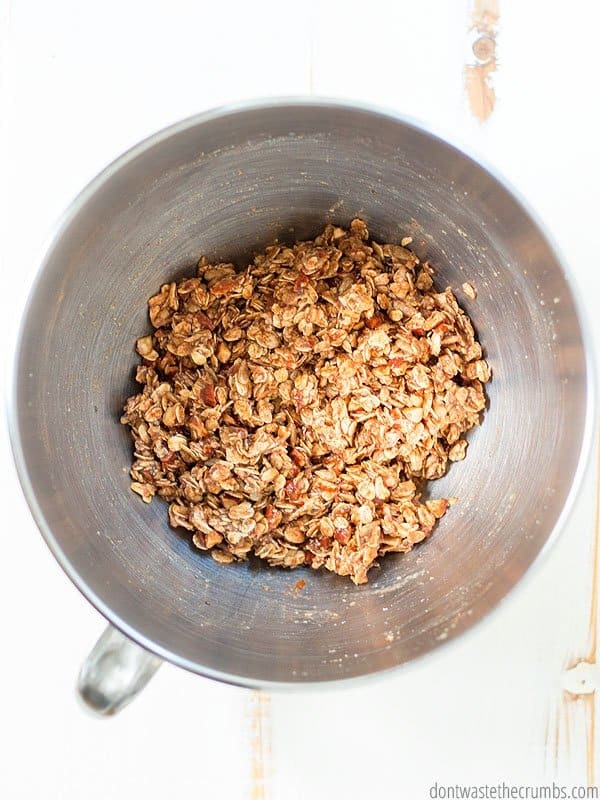 Today I’m sharing with you a cinnamon granola recipe that could be used all year long! I should confess though, that when I first set out to make this recipe, I had my heart set on making apple cinnamon granola. In the middle of pumpkin everything season (i.e. pumpkin spice coffee creamer, pumpkin swirl brownies and pumpkin chili), I asked my non-pumpkin people their preferred seasonal flavor. Hands down, they chose apple cinnamon. Hence the goal of an apple cinnamon granola recipe. What I realized in testing though, is that you’d need an enormous amount of apples in order to pull it off. And the more applesauce you use, the more oats you need to balance the wet vs. dry ingredients. What was happening, is that I wasn’t getting more apple flavor in my granola. I was just getting more granola. 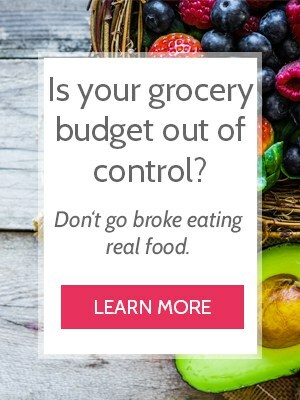 You could argue that adding dried apples would take care of that issue, but not everyone has access to dried apples. We’ve had this dehydrator for YEARS and we love it (especially because it works just as well as other expensive models! ), so theoretically *I* could make dehydrated apples (and here’s my recipe to do that). But I didn’t want to make a recipe where YOU needed dehydrated apples. What if you don’t have a dehydrator? I certainly don’t want that standing in the way of you making a granola. So I switched gears, took out the goal of “must taste the apple” and aimed for a solid cinnamon instead. And wouldn’t you know, that’s exactly what this is! I have a lot of it (when it’s on sale, I buy it by the gallon from Tropical Traditions). I use it all over the house from removing make-up, to making magnesium lotion and for making my favorite breakfast ever. I don’t think it tastes like coconut personally, but if you’re sensitive to the flavor, I recommend refined coconut oil. It’s been pressed twice, so the coconut flavor is practically non-existent. 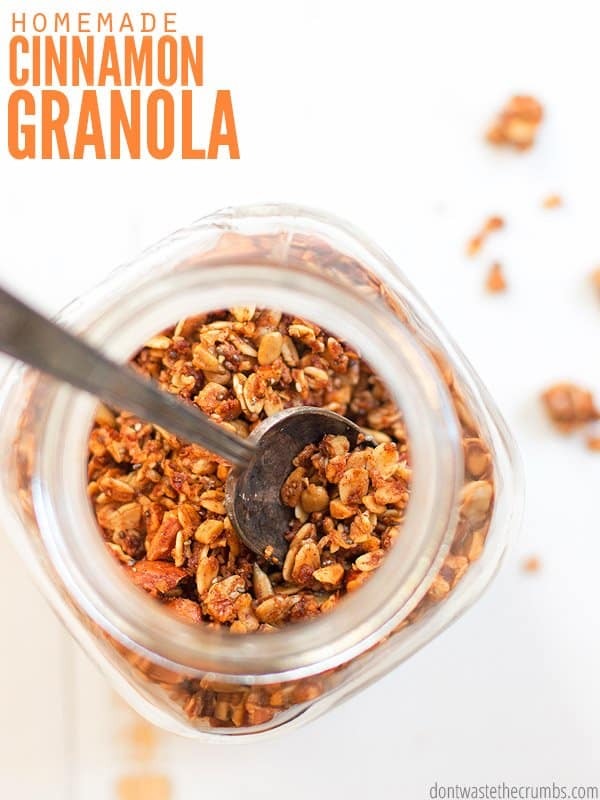 Besides already having a lot of it in my house, I like using coconut oil in granola because it helps to make AWESOME little granola clusters (see below). If you can believe it, this recipe only contains 3 Tablespoons of sweetener!! Part of that is because we’re also using applesauce. This was the original basis for the apple cinnamon granola. That idea got tossed out the window, but I really liked the flavor of the granola with the applesauce. 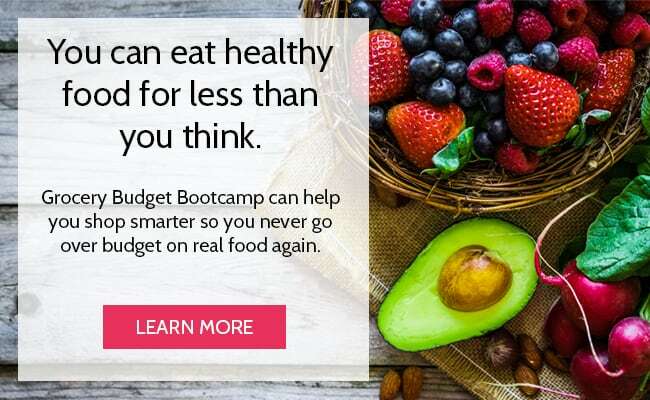 Plus keeping it means we can add less sugar too! Tip: Be sure to read the ingredients in your applesauce. All of the conventional applesauce I found at Kroger contained added sugars, so I ended up buying organic. I believe ALDI has a solid applesauce, or you can always make your own. If you go that route, here’s how to can it! We go through a lot of oats in my house, and I usually buy them in bulk from Costco (it’s this exact same box found on Amazon). You can use other types of oats if you prefer… quick oats, thick rolled and old-fashioned oats all work just as well. Use whatever you have! 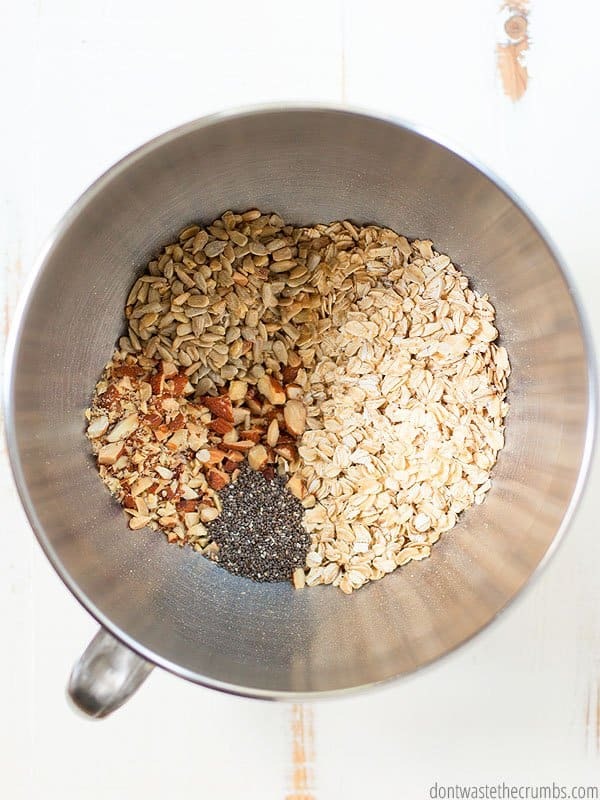 I think a good granola recipe has a ratio of 1 part nuts and seeds to 3 parts oats, but whether you choose nuts OR seeds OR a combination of both, is entirely up to you and what you have in the pantry. 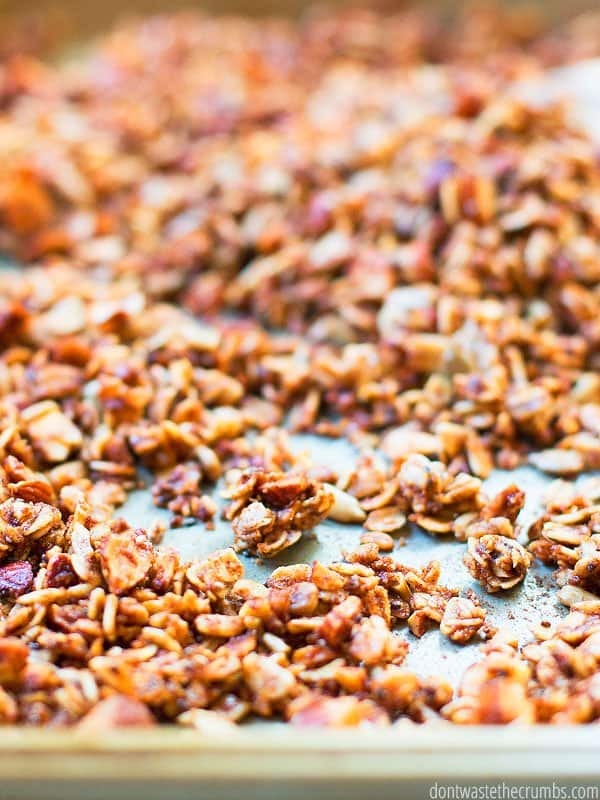 I made this cinnamon granola recipe using a mix of almonds, sunflower seeds and chia seeds and it was awesome. As I find pecans and walnuts on sale this month, I’ll make another batch with those. In its purest form, we’re using just cinnamon and salt. However, I originally used apple pie spice and that was really good. You could also use pumpkin pie spice too, and it would make a great holiday-inspired flavor! Since we stopped buying cereal, granola is what we have on “cereal Fridays.” My kids love it with milk, just like you would a bowl of cereal. Personally, I like it with yogurt, all mixed up together. We once gave homemade granola to the kids’ teachers as a Christmas gift and they loved it! That’s what we’re doing again this year, and since it’s inexpensive to make, we can give more! 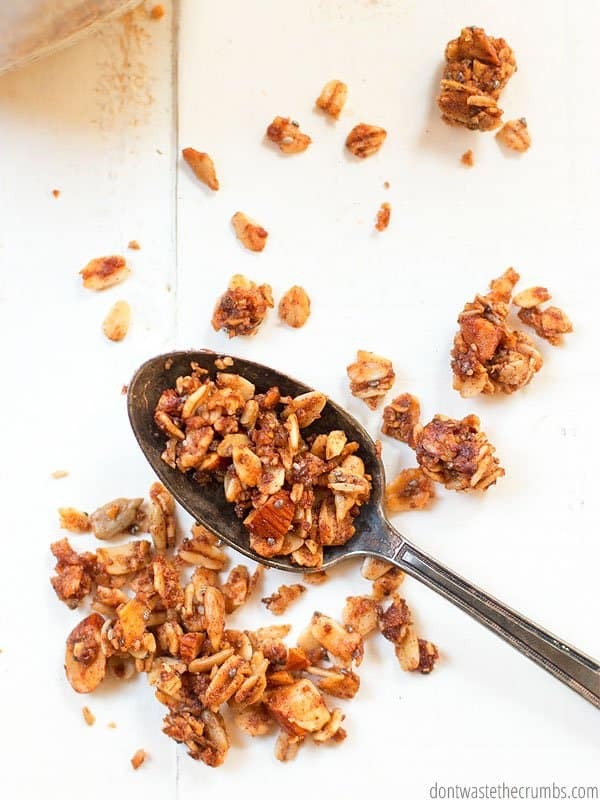 Before you jump in, let’s talk about the tools you need to make this cinnamon granola recipe happen. Cookie Sheet – I used a large 13″ x 17″ cookie sheet so I can get a nice single layer. If you don’t have a big one, use two smaller ones. 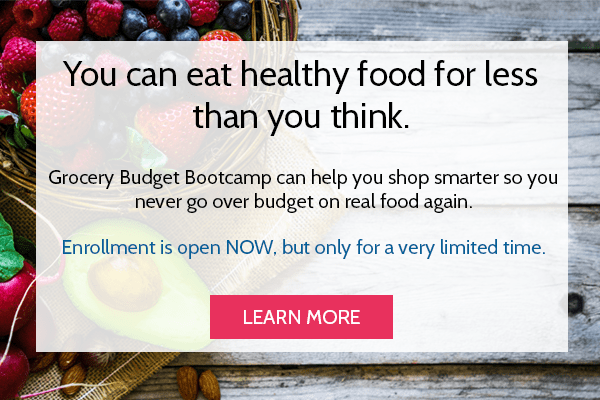 Big Spatula – As much as I love having small spatulas to get out the last bit of peanut butter from the jar, or scraping out what’s left of the tub of yogurt, you’ll be better off using a big spatula when you make granola. This set has both! Combine the wet ingredients in the bowl of a stand mixer. Turn mixer on low and mix until the ingredients are combined, about 1 minute. Add the dry ingredients while the mixer is on low. When all of the dry ingredients have been incorporated with the wet, turn the mixer off. 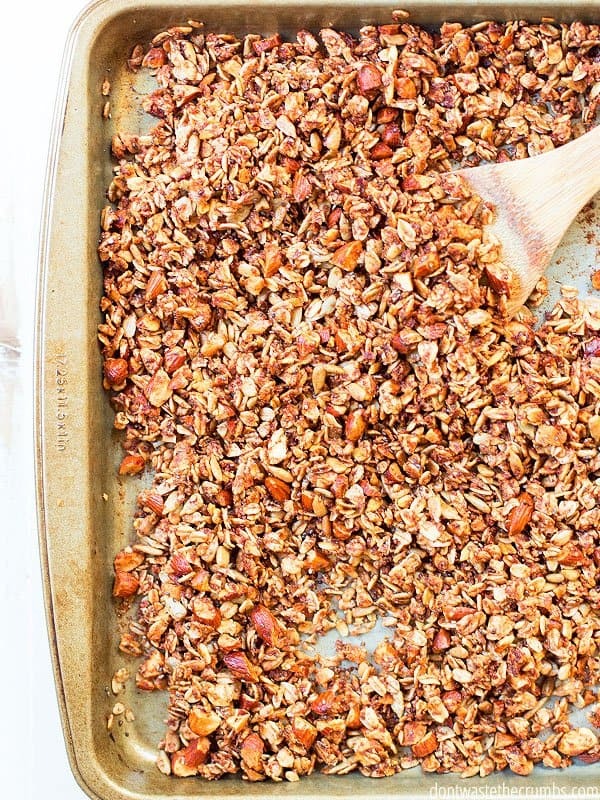 Scoop granola into a single layer on a large 13" x 17" cookie sheet (or use two smaller cookie sheets). Bake in the oven for 1 hour, turning every 20 minutes (set the timer). Remove from the oven and do not turn or stir. Let it cool completely before moving to storage. This keeps the clusters in tact. Does your family like granola? How do they like to eat it? Do they have a favorite flavor? I didn’t have any maple syrup (gasp) and swapped 1:1 with honey and it still turned out great! Makes the entire house smell so good! We made some to take to our local fire department and my husband and kids requested a double batch when we got home. Thanks for another fabulous recipe! 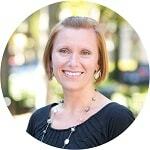 You’re so very welcome Kristin!! I came across this recipe and loved that it uses apple sauce and less maple syrup. 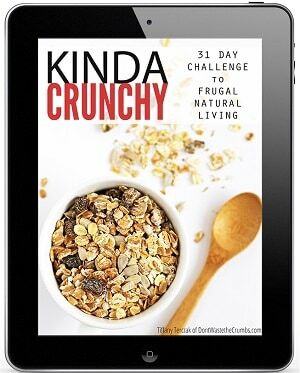 We all enjoyed it and it is now our new granola recipe. Thanks! 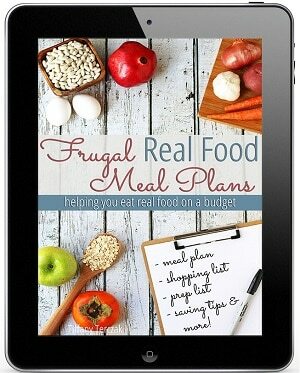 Hearing that one of my recipes is a new go-to recipe for someone else makes my day – thank you Carly! Do you use raw almonds and sunflower seeds? Or just whatever is on sale? Curious if you always use raw, roasted, or something else. Whatever is on sale Rachael!